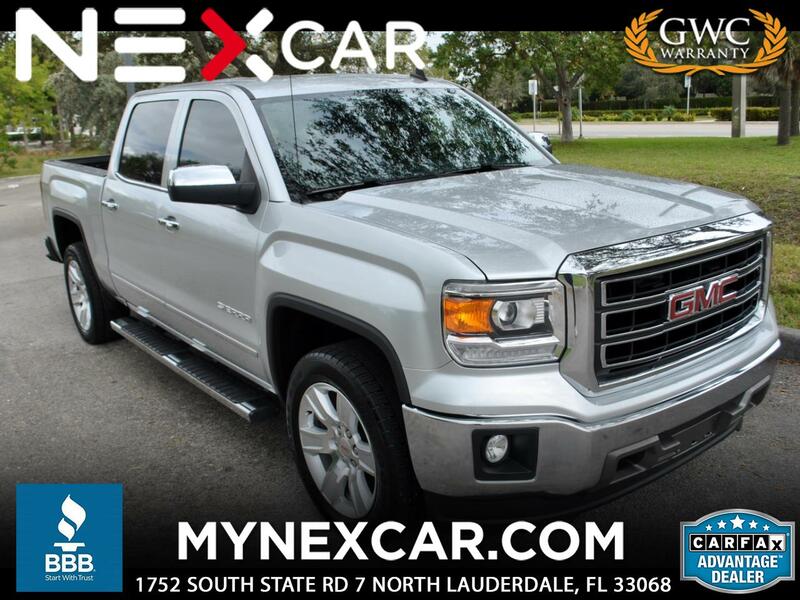 THIS IS A FLORIDA ONE OWNER TRUCK WITH ALL THE COMFORT AND PERFORMANCE YOU EXPECT FROM GMC. THIS 2014 GMC SIERRA 1500 CREW CAB IS THE SLT MODEL, WHICH FEATURES REAR DEFROSTER, PRIVACY GLASS, POWER WINDOWS, TRAILER HITCH RECEIVER WITH MAXIMUM towing CAPACITY OF 11400 LBS, ALARM, BACK-UP CAMERA, DUAL ZONE A/C , CRUISE CONTROL, FOG LAMPS, REAR PARKING AID, REMOTE ENGINE START, ADJUSTABLE STEERING WHEEL, STEERING WHEEL CONTROLS, LEATHER WRAPPED STEERING WHEEL, UNIVERSAL GARAGE DOOR OPENER, KEYLESS ENTRY, POWER DOOR LOCKS, ELECTROCHROMIC REARVIEW MIRROR, HEATED MIRRORS, POWER MIRRORS, POWER FOLDING MIRRORS, DRIVER VANITY MIRROR, DRIVER ILLUMINATED VANITY MIRROR, PASSENGER ILLUMINATED VISOR VANITY MIRROR, POWER STEERING, AM/FM STEREO, AUXILIARY AUDIO INPUT, CD PLAYER, HD RADIO, MP3 PLAYER, SIRIUS/XM SATELLITE RADIO WITH 3 MONTHS FREE SERVICE, OPTIONAL WIFI HOTSPOT AND SMART DEVICE INTEGRATION, ONBOARD HANDS-FREE COMMUNICATIONS SYSTEM AND WIRELESS CELL PHONE HOOKUP, HEATED FRONT SEATS WITH DRIVER AND PASSENGER LUMBAR SUPPORT ADJUSTMENT, POWER DRIVER AND PASSENGER SEAT, PASS-THROUGH 2ND ROW BENCH SEAT, 6-SPEED AUTOMATIC TRANSMISSION WITH 4-WHEEL ABS DISC BRAKES, ELECTRONIC STABILITY CONTROL, DAYTIME RUNNING LIGHTS, INTEGRATED TURN SIGNAL MIRRORS, ADJUSTABLE PEDALS AND TRACTION CONTROL. THIS IS THE RIGHT TRUCK FOR WORk AND PLAY. COME SEE IT TODAY! ** Dealer disclaimer all vehicles are subject to prior sale. While every attempt has been made to ensure the accuracy of the data displayed, the dealership is not responsible for any errors OR Omissions. Internet Prices are based on Cash Purchases Only. Prices do not include dealer fee, applicable sales tax, title, registration fee and $147.95 Electronic Filing fee. Every vehicle comes with a complimentary CARFAX report. Feel free to take the vehicle to be inspected prior to purchase. There is a U$750 Draft Fee for Customers Financing with their own Lender. Visit NexCar online at www.mynexcar.com to see more pictures of this vehicle or call us at 954-971-5500 today to schedule your test drive.